This family-friendly, Halloween-themed celebration, which will include the community’s beloved costume parade and store-to-store Trick-or-Treating, will run from 3:30 to 6 p.m. Friday, Oct. 27. The Downtown Ithaca Alliance (DIA) is teaming up once again with the Greater Ithaca Activities Center (GIAC) to proudly present this annual tradition. The parade will start at the GIAC, 301 W Court St., Ithaca, at 3:30 p.m and participants will march their way to The Commons, E. State Street, Ithaca. As parade goers make their way to The Commons pedestrian mall they will find dozens of stores participating in all sorts of spooktacular activities (look for a “Trick-or-Treat Here” sign prominently displayed in their storefront window indicating that treats are available). Participating stores are located on the Commons, Aurora Street, East State Street off of the Commons, Gateway Commons, Cayuga Street, Green St. and inside the Dewitt Mall. This afternoon of innocent and fun frolic will also feature FREE face painting by Festive Face Painting, music, mini carnival-style games, warm apple cider and snacks from 4 to 6 p.m. inside Center Ithaca, 171 E. State St., Ithaca. GIAC is catering the event. “Halloween in Downtown presents a prime opportunity for families to check out downtown’s locally owned and operated boutiques, specialty shops, restaurants, and attractions while collecting candy and other treats at participating locations. The children typically have a great time, and the shopkeepers enjoy seeing all of the trick or treaters,” says Allison Graffin, the DIA’s marketing director. A complete schedule of activities is available online at http://www.downtownithaca.com. 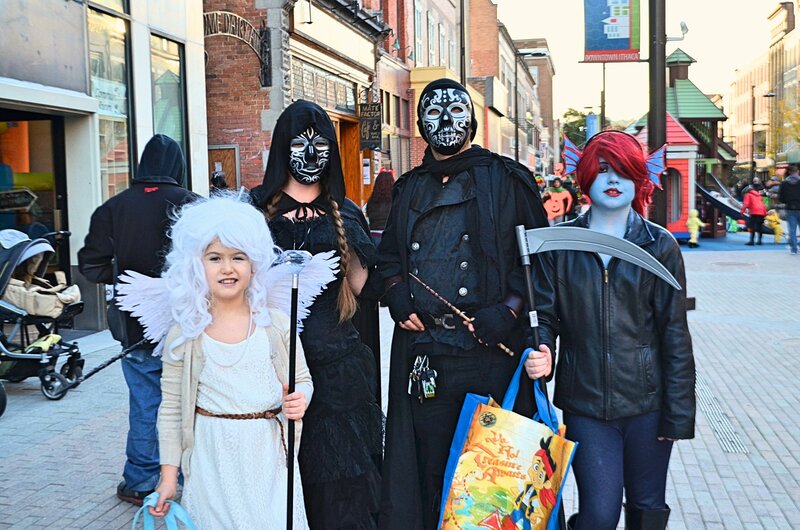 Halloween in Downtown Ithaca is happening in conjunction with the 3rd Annual Ithaca’s Wizarding Weekend, a very popular event where downtown Ithaca’s streets will be filled magic and whimsy from October 27 through October 31. As a nonprofit adventure, Ithaca’s Wizarding Weekend is inspired by the Harry Potter series created by J.K. Rowling and provides a magical look into the Ithaca community while simultaneously allowing fans to celebrate. Wizarding Weekend is organized by Life’s So Sweet Chocolates and Press Bay Alley. More information, including a full schedule of events, can be found at http://www.wizardingweekend.com. All of these festivities are free admittance for community members of all ages. During Wizarding Weekend, a $5 all-day festival parking fee will be in effect at the Green St., Cayuga St. and Seneca St. garages on Saturday and Sunday. For more information, visit http://www.downtownithaca.com, email info@downtownithaca.com, or call (607) 277-8679. ITHACA SEPT. 27, 2017 — Today, the City of Ithaca and the Downtown Ithaca Alliance (DIA) are receiving a significant monetary grant for one of downtown’s latest initiatives, Pay It Forward, a community partnership program that enables people in need to easily access food, toiletries, and personal supplies at participating downtown shops and restaurants. Downtown Ithaca will join City of Ithaca Mayor Svante Myrick during a special ceremony on Wednesday, Sept. 27 at 2 p.m. on the Bernie Milton Pavilion stage in Bank Alley on The Commons to receive a $50,000 Outstanding Achievement award from The United States Conference of Mayors’ (USCM) CommunityWINS Program and Wells Fargo, which supports the USCM program. Downtown Ithaca will apply the monetary award to Pay It Forward. Following the award presentation, light refreshments will be available. Pay It Forward is managed by the DIA, a not-for-profit community development organization charged with creating and sustaining a vibrant and healthy city center. CommunityWINS funding will help the DIA replenish Pay It Forward funds at the participating businesses and allow the DIA to purchase marketing materials aimed towards downtown workers and visitors. The DIA has already purchased and displayed three money collection kiosks where the public can make personal donations. The three red donation boxes are located downtown on Aurora St., in Home Dairy Alley, and in Bank Alley. All of the money collected from the donation boxes is used to buy food, sundries, and basic necessity items for Ithaca’s homeless and people in need. The community can donate to Downtown Ithaca’s Pay It Forward program by placing cash, checks, or coins in the donation boxes. Pay It Forward boxes are located in three spots on the Ithaca Commons. “We are honored the United Conference of Mayors and Wells Fargo recognizes this special downtown program which serves as an appropriate way to assist individuals who are in need. The $50,000 grant will certainly strengthen Pay It Forward and will greatly benefit those in need who receive items from it,” says DIA Executive Director Gary Ferguson. The DIA thanks USMC and Wells Fargo for the funding and thanks the City of Ithaca, the downtown Ithaca businesses, and the Ithacash program for participating in and supporting the Pay It Forward program. The 2017 CommunityWINS award is given to city-based nonprofit organization initiatives and recognizes mayors for exemplary leadership in developing local programs that promote long-term economic prosperity and improve the quality of life for residents in three categories: neighborhood stabilization, economic development, and job creation. The City of Ithaca was one of six cities selected from 245 applicants who were seeking funds. “Our 2017 CommunityWINS℠ Grant Program gives the Conference an opportunity to showcase positive change happening now in our cities to make a difference in the lives of residents. We are grateful to Wells Fargo and the Wells Fargo Foundation for their support of the CommunityWINS℠ Program, which also highlights the talent and commitment of mayors and city governments,” says Tom Cochran, CEO and executive director of the U.S. Conference of Mayors. For more information about Pay It Forward, contact the DIA at (607) 277-8679, email info@downtownithaca.com, or visit www.downtownithaca.com. Downtown Ithaca’s initial release regarding its Pay It Forward program is available by clicking here. About the Downtown Ithaca Alliance: The Ithaca Downtown Business Improvement District (IDBID), is a State of New York chartered 501c3 not-for-profit organization charged with the revitalization, development, promotion, and management of downtown Ithaca. The IDBID operates as the Downtown Ithaca Alliance (DIA). The Downtown Ithaca Business Improvement District was founded in 1997. About Wells Fargo Housing Foundation: Wells Fargo & Company (NYSE: WFC) is a nationwide, diversified, community-based financial services company with $1.8 trillion in assets. Founded in 1852 and headquartered in San Francisco, Wells Fargo provides banking, insurance, investments, mortgage, and consumer and commercial finance through 8,700 locations, 12,800 ATMs, the internet (wellsfargo.com) and mobile banking, and has offices in 36 countries to support customers who conduct business in the global economy. With approximately 265,000 team members, Wells Fargo serves one in three households in the United States. Wells Fargo & Company was ranked No. 30 on Fortune’s 2015 rankings of America’s largest corporations. Wells Fargo’s vision is to satisfy our customers’ financial needs and help them succeed financially. Wells Fargo perspectives are also available at Wells Fargo Blogs and Wells Fargo Stories.